Best Chinese Knives: EDCGEAR Titanium Box Cutter/Utility Knife Review! 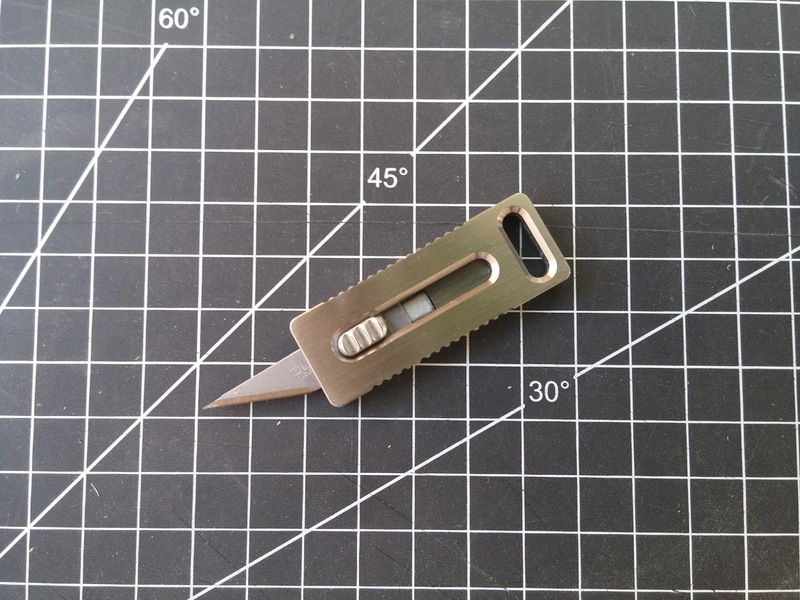 EDCGEAR Titanium Box Cutter/Utility Knife Review! I've received this one a while ago, carried it quite a bit and now I'm ready to do a review on it. The knife arrived in a pretty fancy cardboard box (that had a cutout for a coin knife, but fitted for this knife as well), no issues out of the box. - Great for EDC. The knife is pretty light and compact, will fit a key chain or that small pocket in jeans (that's where I've been caring it), thus leaving more room in your main pockets. 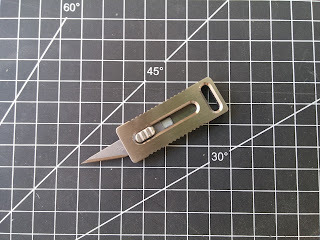 It also features a magnet, that holds the blade (providing sort of a detent) in the closed position, enabling added security from accidental cuts (works great). - The blade is a standard and genuine OLFA one, which are known for their quality (keeps very good edge for a slim utility style blade). This also means it will be pretty easy to find a replacement if needed. - Nice fit, finish and design - the cutouts are chamfered, the scales fit great, has gimping on both sides and the button that add to the grip. Also has comfortable one-hand opening. - Made from real TC4 titanium alloy (feels light in hand). - The knife will be legal to carry in places, where locking blades are prohibited (such as UK), because the knife has no lock and you need to keep your finger on the button in order to keep it open while cutting (which is surprisingly pretty comfortable). It is also a people friendly knife and probably won't scare anyone when deployed and used. - Another useful feature is the ability to get only the tip of the blade out to perform controlled cuts (for opening clam shell packages). - The finish on the ti is satin, which allows it to be scratched easily and for the scratches to be visible. I would prefer a stonewashed finish for that reason (maybe will do it myself). - Because of the magnet detent, the back of the blade rubs on it on the way out and back in and that leaves a scratch. Not a huge issue and doesn't hurt the functionality. - The cutting edge is pretty short (2cm/ a bit less than an inch), so won't be useful for tasks where a longer blade is needed (like food prep). - Overall a great concept for a one-handed opening box cutter/backup blade, which is EDC'able, safe, legal, people friendly, and useful, especially in an office environment. I've found myself caring it more and more because of those qualities. Can you tell me the best stores to look at for good clones on DHGate and AliExpress? Yeah, look in the first post of my blog. Those are the one I buy from and they are great. They carry this at HK Equipment for about the same price. I ordered something from them for the first time and it took less than a week for tracked airmail...not sure if that is normal. They also have this: http://www.hkequipment.net/product-p/edckfsls.htm which is a clone of what may be the original inspiration for this knife, made by a small 1-man company in the US. For that reason I hesitate to buy it from HK Equipment. My bad, it's nearly twice as much from HKE...got my Chinese sources mixed up. Yeah, that's definitely the clone of the TUKK. I like the one I reviewed better, cause it uses real OLFA blades, has a longer blade and no magnetic retraction.